Holly's Horrorland: You're Invited to a Sanguinary Soiree! You just post something vampire related on Feb. 14th. Let me know if you'd like to join, and I'll add you to the guest list! Hope you'll join us lady vamps. And no problem! I appreciate the kind comments you post on mine too. I'm in, Holly! A vampire soiree sounds like just my cup of blood... er... tea!! I'll link to your post on Facebook and Twitter as well! Thanks so much for spreading the word, Emma! I was actually going to make this a Blood Tea Party, but didn't want to scare the men folk away. Though it seems I have anyway! lol. Oh well. Looking forward to seeing what others post too! Thanks, Lilia! I hope this will be as fun! Yay! Thanks for joining, Nicole! Welcome and thanks for joining, Lorelei! I'm thankful to Emma for directing you here too! Welcome and thanks for joining, Lady Bethezda! That's the one good thing about being unemployed. Awesome list of participants so far, but where are all of my other blog brothers at? Oh well, if it's just me and all the ladies I won't complain haha. Glad to have you here and back in the Blogosphere! Welcome, Lurker! Glad to have you here! Would you like to be added to the guest list? Hi! I would love to join! Hey! Thanks for joining, Jen! Thanks for joining, Pensive Pumpkin! Sorry for making you stut-stut-stutter. Oh no, there I go! I want in on the funs! Fangs for joining the funs, Greg! Hi, I'd like to join! Hey! Fangs for joining, Matt! I was planning on doing an Underworld Awakening thing at some point - this might just be the time to do it! He did a great job on the picture. I'm surprised I haven't heard of your blog before. It's lovely! Welcome and thanks so much for joining, everyone! Yay I'm able to reply again! Sounds good I'll be joining! Welcome and fangs for joining, ladies! What fun! Count me in!! ﻿Oooh! Lovely way to spend Valentine's Day! This sounds awesome. I've been looking for an alternative, V-day blog fest. So sick of hearts and flowers. Oo, this looks like fun! Well, I'll definitely post about vampires! What I do in the evening, UK time, depends on what time I get back from my night out with the other half. Also! I can't believe I hadn't found your blog previously. Found it via Sophistique Noir. I finally got a vampire post up on my blog. I wanted to get it up earlier but everyday life often gets in the way of the best laid plans. Anyway, here's my info. Since I used an excerpt from one of my vampire stories I should probably clear up any confusion by saying that I write fiction under the name of A.D. Vick. Still, you can use Nightwind for today's purposes. Thanks! sorry I'm late, been a bad day, need a drink ! 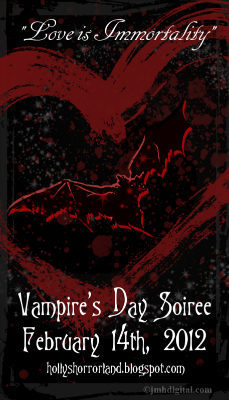 Until the past few days, I had not heard of Holly's Horrorland, so this Vampire's Day Soiree is a good thing for more than one reason. Anyway, I've added a link to this site on my blog. Maybe it will help someone else to discover it. Thank you! And yes, I'm so glad the Soiree has been such a success! ...And I'm happy to meet you too!